That title is both fascinating and disturbing. Similarly, the Facebook page “Kissing Fish: Christianity for People Who Don’t Like Christianity” recently shared an image of a banner for a series being done by a group of eight churches in Phoenix, Arizona. The quotation marks around the word “Biblical” are conspicuous in their absence. Another blogger from the Evangelical channel on Patheos wrote a post titled What Is Progressive Christianity? What Do They Believe? Is It Biblical? As you may have guessed, the answers are “Heresy,” “Lies,” and “Absolutely not,” though not in those words. “Biblical Christians,” as they call themselves, assume that the Bible is flat like a textbook, each word and each verse containing ultimate truth from God. If any of it is anything less than perfect for every reason, then all of it is. If the Genesis accounts are myths, then we have no reason to believe in the resurrection. The Bible is Basic Instructions Before Leaving Earth. It contains everything we need for life and godliness, and principles of wisdom we can extrapolate into helping with just about anything. The “Biblical view,” as it is called, has several serious problems. The first problem is that nobody can agree on what constitutes True Biblical Christianity. As Christian Smith points out in the beginning of The Bible Made Impossible, this isn’t even tenable because everybody disagrees on what True Biblical Christianity™ even is! While people who believe they are “Biblical Christians” may often come together (largely due to cultural similarities) on issues they consider important, they often disagree fundamentally on rather important doctrinal points. Is baptism necessary to salvation? Can all freely choose God, or does God have to choose us? This happens, of course, because of the second problem: the marvelous diversity of thought and opinion about God found in sacred scripture. I have argued that there are two creation stories in the opening chapters of Genesis, but have learned since (in a book co-written by the pastor of The Fountains United Methodist Church) that scripture has other unique creation accounts, including one in Psalms. Job, Proverbs, and Ecclesiastes are fascinating conversations about whether or not the righteous are rewarded for righteous behavior. Proverbs says yes, Ecclesiastes says no, but we should behave righteously anyway, and Job says sometimes bad stuff just happens. We do scripture a great disservice when we attempt to remove the God-inspired ambiguity from it. Men (mostly men) wrote about their experience with God as best they understood, in a way that carries through it a thread of divine inspiration. Dave Ramsey claims the Bible talks about money more than anything else, and that his view of money is “Biblical.” But which “Biblical” is it? Is it Biblical in the sense of Jesus telling the rich young ruler to sell all his possessions to feed the poor, or is it Biblical in the sense of Proverbs, which says a good man leaves an inheritance to his children’s children? If you’ve heard Ramsey’s program or taken one of his money management courses, the answer should be obvious. But which is more Biblical? The answer, of course, is that both are Biblical, and that they are incompatible. One cannot simultaneously donate all one’s goods to the poor whilst also leaving an inheritance to one’s grandchildren. Ramsey would probably assume Jesus’ words were metaphorical, or only intended for the rich young ruler to show him his attachment to his stuff, or to encourage him to be generous. All of this compromises what Jesus actually said and is by the “Biblical” standard, unbiblical. Progressive Christians and Red-Letter Christians would likely prioritize Jesus’ words over Solomon’s. Both answers are “Biblical,” but which is right? A thought from John Dominick Crossan, that “We are Christians, not Biblians,” may hint at which answer is the more Christian. The best way to play that game is not to play, but the second-best and most fun is to out-proof-text the proof-texters and call “unbliblical” on them before they call it on you. Which brings us full circle, back to that article from the Fox affiliate in Phoenix, and back to Brandan Robertson. The Fountains is the only progressive church in Fountain Hills and Felten says it offers an option to biblical Christianity. “That lets people know there’s a choice out there, they don’t have to deny science, they don’t have to hate their gay neighbor, they don’t have to read and take the bible in a way that causes them to abandon their rational mind,” he said. I read a book Felten co-wrote called Living the Questions. From what I’ve seen, Felten would never call his brand of Christianity “unbiblical,” because I don’t think he believes Biblical Christianity is even a tenable option. He also argues differently. Unlike the person who titled the show, he does not commit the logical fallacy of begging the question by assuming the answer in the question. Brandan does not call those who disagree with him unbiblical. He is fair and honest and simply says that he reads the Bible differently than they do. That statement implies that the title of the program is unfair and dishonest. You can’t pit Progressive Christianity against Biblical Christianity, people. Not because Progressive Christianity is unbiblical – that is, running counter to Biblical teachings. It isn’t. It just reads scripture differently than self-described “Biblical Christians,” and it ignores and interprets around different passages than “Biblical Christianity” does. 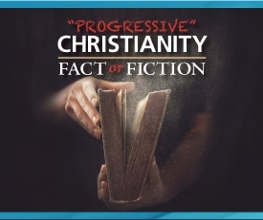 The reason you cant pit Progressive Christianity against Biblical Christianity is that Biblical Christianity, as it is be meant by its purported followers, does not exist, nor can it. Exactly the way I was taught to read it, long before I’d ever heard words like “canon” and “hermeneutic” (not to mention “exegesis” – to which my first reaction was “what kind of Jesus?” OK, gimme a break, I was only 10 at the time, LOL!)! In my experience (Preacher’s Kid who grew up on a seminary campus in the mid-60s when my dad was a student), Progressive Christianity is far more biblical than “Biblical Christianity” will ever be. The rule at my house was that anything anyone else wasn’t currently reading was fair game. Challenge accepted! Dad started sending me to Kittel and the Greek lexicon when I was 10 or 11. Higher criticism, exploring the contradictions, and a view of faith and the scriptures that was both holistic and contextual were just the way we rolled. A Biblical Christian believes that only faith in Jesus saves not good works, unlike “progressive Christians who think that they must work for their slavation. As Paul said good works without faith is a filthy rag and means nothing to the Lord. While Biblical Christian rely solely on the Lord for our good works “progressive christian” seem to rely on government to carry out good works. Please tell me where in the Bible goe it say for government to do good works?. That’s odd. I’m a progressive Christian and believe that only faith in Jesus saves, and that faith produces good works; as scripture teaches, “faith without works is dead.” Progressive Christians don’t think they must work for our salvation, but rather that we must work out our salvation, with fear and trembling, as Philippians 2:12 says. I should make clear that, though I believe “Biblical Christianity” as I have described in this post is impossible, my progressive Christian faith is also not unBiblical either. You asked for verses? I have verses. Moreover, Nathan the prophet confronted King David himself on several occasions, insisting that the King (the government, such as it was) submit to God’s laws. (See Bathsheba). “Biblical Christians” cannot deny what the Bible says. If you do a simple Bible search for the word “poor,” you will find God’s heart for social justice for the needy, and you will also find prophetic voices delivering frequent imperatives to rulers and all in authority to help the poor. Search for “widows” and you will again find God’s heart for society’s most vulnerable. I am a progressive Christian, and my progressive Christianity is rooted in my understanding of the Bible. Calling for social justice is not unbiblical. Ignoring the poor is unbiblical. I can reassure you that Biblical Christians are not a myth because I am one of them. If there was no Biblical Christianity then logically there should be no one calling themselves Biblical Christians?. Then why are there those like myself who identify as Biblical Christians? We are not myths, we are flesh and blood like all other types of Christians and we exist. That doesn’t follow. People can call themselves all sorts of things that don’t exist. I can call myself a square circle but that won’t make square circles any more logically possible. You can be a Christian who follows some of the Bible, to be sure, but you cannot be a Christian who follows all of it. It’s logically impossible because the authors of scripture are in a conversation about God, a conversation in which they sometimes disagree. When scriptural authors disagree, we have to interpret. We find ways around obeying parts of the Bible we don’t like, whether it’s “Oh, that’s old testament” (not eating shrimp or stoning disobedient children), or “Well, Paul was conforming to the culture” (women not wearing head coverings). I don’t doubt that you believe you’re a “Biblical Christian,” but if by “Biblical Christian” you mean what I’m talking about in my post when I say they don’t exist, you may have flesh and blood to be sure, but a firm belief that you’re a Biblical Christian doesn’t make you one any more than a firm belief that you’re a kumquat would. I ask again please sight chapter and verse where the Bible contradict it’s self? The word you’re looking for is “cite,” and I will not fall into that trap. I give an example, you invent some reason why it shouldn’t count. I give another; you invent another reason. I give a hundred examples; you provide a hundred explanations – some of them valid, some harebrained. But you insist? Here: http://bibviz.com/ This page offers countless examples of disagreements between Biblical authors. Even if some or many are invalid, there are enough there to provide troubling evidence that even if the Bible doesn’t contradict itself, God left lots of compelling reasons for skeptics to think it does, which I submit is problem enough. Please tell me where in the Bible do the authors disagree with themselves when according to 2Tim :3-16 ALL scripture is God breathe, Are you saying God contradicts himself? That is illogical if God is perfect and guided these men in their writings. Biblical Christians do not follow the Old Testament laws because they were fulfilled by Jesus on the cross but not done away with. That is why we do not refrain from eating shrimp and pork and are not stoned nor stone for these sins and others. I am a Biblical Christian not just because I call myself that but because I recognized that I have sinned against God, accepted His son as a sacrifice for my sins and now have a personal relationship with him. That is what Biblical Christianity is, a personal relationship with God through Jesus Christ and His word. This is why I did not wish to reply: I knew no evidence would convince you that such contradictions existed – not even their clear delineation. I gave you a link to a long list of places in which the authors of scripture disagree with each other, and your response was to insist that those contradictions did not exist because (based on your theological perspective) they *cannot* exist. 2. Therefore, no matter what evidence to the contrary, contradictions do not exist. You don’t know (1) to be true. That scripture is inspired by God does not mean that it was not also *written* by men – men who disagreed with each other. Furthermore, even if scripture claims inspiration, that does not grant it inspiration any more than identical claims from the Book of Mormon grant it inspiration. I could write “This blog is God-breathed” at the top of my blog; that would hardly make it so. What evidence do you give for believing the Bible is inspired and accurate in its claim to inspiration? Nevertheless, I fear that we may be arguing over words. If you call yourself a Biblical Christian because of the things in your third paragraph, this post has no quarrell with you. My concern, as I attempted to clarify in this post, is with those who call themselves Biblical Christians and argue that anyone who disagrees with them about theology (liberal Christians, for example) are *not* Biblical Christians. If liberal Christians such as myself can be Biblical Christians, according to you, then I have no quarrel with what you mean when you say “Biblical Christian” and, by your definition of what a Biblical Christian is, am content to leave it alone. Liberal Christians are NOT Biblical Christians. It seems to follow that a Biblical Christian is one who (a) recognizes he has sinned against God, (b) accepted his son as a sacrifice for his sins, and (c) has a relationship with him. Suppose a liberal Christian meets all those qualifications. By your standards, why would they not then be a Biblical Christian as well? But liberal Christians won’t because most of them do not believe in the deity of Christ, don’t believe that all scriptures (the Bible) are inspired by God, (as you seem to imply by saying the book of Mormon is inspired. ), don’t believe in the atoning blood of Christ, His resurrection and ascension to heaven, nor that Jesus is God in the flesh. who came to earth to be the sacrifice for our sins. You are quite wrong about me. As a liberal Christian, I do believe that Jesus is the only way. It’s a common misconception about us liberal Christians. Some of the universalists among us believe God saves through everyone through Christ, not just those who knowingly come through Christ, in the same way an unconscious person might not recall coming through the front doors of the hospital or do so intentionally, but is brought through those front doors just the same. I do affirm the deity of Christ, and I do believe all scripture is inspired by God. I never said the book of Mormon is inspired; only that the book of Mormon claims inspiration, and asked how you differentiate between its claims and scripture’s. I’m puzzled by you, to be honest. I thought conservative Christians believed we were saved by grace through faith. When did believing in the inerrancy of scripture – a teaching invented in the last several centuries and not held by the apostles, prophets, or the early church, become a core tenet of Christianity? That scripture is inspired or even “God-breathed” does not mean it was not also written by men. Even that phrase, “God-breathed,” may have meaning lost to us today. Christ is our center, my friend. Christ is the Word of God, as John tells us. Nowhere in scripture is the Bible said to be the Word of God, but Jesus, over and over, is. The Bible is sacred scripture. Scripture is God-breathed, for it testifies of Christ. Christ is the key to scripture. We must not elevate scripture above Christ. We must not elevate Paul above Christ. Christianity is not about the Bible. Christianity is about Christ. We must not fall victim to this deception and, with the pharisees, “search the scriptures because [we] think in them we have eternal life,” for the scriptures’ purpose is to testify to Christ. Precisely. The Word refers to Jesus. If the Bible is The Word, then the Bible is God. As Christians we affirm that God is Father, Son, and Holy Spirit, not Father, Son, and Holy Bible. If the Bible is not God, then the Bible cannot be the Word. God is the word the Bible is his word. read Jon 1:1 carefully. Why do you want to ignore God’s word, the Bible? John 1:1: “The word. Was. God.” If the Word is the Bible, then the Bible is God. You’re not seriously saying you think the Bible is God?! the word is God The Bible is his word. Why are you having difficulty understanding that. I’m not having difficulty understanding the words that you’re saying; I’m having difficulty believing that you mean them. To be frank, I’m stunned. Consider: If A = B, and B = C, then A = C.
If (the Word) = (God), and (the Bible) = (the Word), then (the Bible) = (God). Everyone, all along the spectrum, liberal to conservative, knows this isn’t true. God is God. The Bible is not God. Not even the most outlandish heretics in Christian history affirmed that the Bible is God. But here you are, claiming to be a “Biblical Christian” and making a statement that cannot possibly mean anything other than that you believe that the Bible is God. But hey. At least we understand one another now. Though… if you think the Bible is the Word, when the Bible nowhere claims to be the Word, and you think the Bible is God, you don’t have a lot of space for telling anybody else they’re not a Biblical Christian. These beliefs are not found in the Bible. Even the Biblical authors who disagree with each other don’t believe that. The word is God as clearly stated in John1:1, I can’t make any clearer then that. Jesus is God and the word is Jesus. You have to believe in the deity of Christ to understand that His word existed before anything else. You do believe in the deity of Jesus don’t you? I’m not saying that Jesus is not the Word. I’m saying that Jesus IS the Word. I’m saying the Word is God. I am affirming what scripture says. I’m saying is that the Bible is not the Word. If the Bible is the Word, then the Bible is God. Therefore, the Bible is not the Word. The Bible is not the Word. Nowhere does the Bible claim to be the Word. Your claim that the Bible IS the Word is unbiblical. That is our fundamental disagreement here. Not that the word was with God. Not that the word was God. Not that word was Jesus. Our *fundamental* disagreement in this thread is whether THE BIBLE is the Word spoken of in John 1:1. I say it’s not, and you say it is. When you say it is, and when you affirm the truth of john 1:1, you are saying the Bible is God. The what is the word if the Bible is not Gods word? The Word, as I just said, is JESUS. (Jesus) = (the Word). (The Word) = (God). Therefore, (Jesus) = (God). If Jesus is the Word, then Jesus is God. This logical progression produces orthodoxy, not heresy. And Jesus is both the word and God. You do believe that Jesus is God don’t you? Do you read my responses before you reply to them? Because I literally just said that. Is the Bible the inspired word of God as stated in 2Tim 316? and since the word is Jesus then he inspired the writing of the Bible didn’t he? Now we’re making progress. Read 2 Timothy 3:16 again. It says all scripture is inspired by God. It does not say all scripture is the Word of God. Nowhere in the Bible does it say scripture, or the Bible, is the Word of God. But don’t worry. You’re in good company. If I had a nickel for every church website that falsely claims 2 Timothy 3:16 says the Bible is the Word of God, I’d be rich. Scripture according to Webster is the books of either the OT or the NT or both and Paul said all scripture meaning OT and NT. I’m not contending what books make up the cannon of scripture. I’m saying that the Bible is not the Word. The fact that you’re not understanding this and keep arguing around it makes me think I’m wasting my time. I don’t usually do this… but you’re blocked. I can’t keep wasting my time on this. And an addendum Liberal Christians do not accept that Jesus is the only way to God (John 14: 6) even when Jesus himself stated so. No, Cliff. Biblical Christians don’t believe that the Bible is the Word, because Biblical Christians don’t believe the Bible is God, and John 1:1 makes it very clear that the Word is God. We literally just went over this. Repeating it won’t make it less heretical. Much of the rest of what you just said is in the ancient creeds, but never have Christians affirmed that the Bible is God.